I have been living as a vegetarian for 10 years now. I decided to make the switch after suffering from severe migraines. It has become a part of who I am and I totally feared coming to Indonesia thinking I would have to eat meat. I remember during my interview with Peace Corps having to explain my flexibility and how I would cope if I were to give up my vegetarianism and because of this I mentally prepared myself during the months leading up to departure. Little did I know that living in Indonesia is super easy for us veggie lovers. The variety of fruits and vegetables are endless. I’ve been pleasantly surprised with the amount of healthy foods that I have been able to find whether in the local markets or grocery stores. Of course, there are still days where you have to dig the chicken foot out of your soup and go about your business as if you didn’t just see half a carcass, but that’s flexibility, right? Even with the variety of fruits and vegetables, staying healthy in Indonesia has been a daily struggle. Before coming to Indonesia, I never ate fried foods but now I find myself eating something fried almost daily. Fried tempeh, fried tofu, bakwan, noodles, rice... the list could go on forever. My host mom helping me cook homemade tortillas. She is obsessed with tacos now. Finding that healthy balance can sometimes be a struggle, especially if you are offered food and want to be polite and not refuse the kind gesture. And let’s be honest, fried foods are delicious! To cope with this, I try to cook all three meals for myself. It has been one of my favorite things to do with my host family because we are able to learn together and sit down as a family to try new things. My host mom is now a bell pepper, butternut squash, guacamole-loving lady. She said she lived her 50 years without trying new vegetables but now she loves trying new foods and swears that everything I cook is “sehat.” I don’t have the heart to tell her that doughnuts and chocolate cake are actually not healthy. Not only has cooking for myself been my number one stress coping mechanism, it has become a way for me to exchange cultures and holidays from around the world. My students have enjoyed pad thai, spring rolls, beignets, guacamole, tacos, churros, salsa and hamburgers all while learning about cultures, foods, and holidays from all over the globe. Also, my host family has taught me how to make some Indonesian staples that I will be so happy I learned when we pulang to America. I’ve learned to make my favorites such as soerabi, bakwan, cap cay and even rendang. We have been able to share so much through cooking, that it will remain one of my favorite aspects of my service. 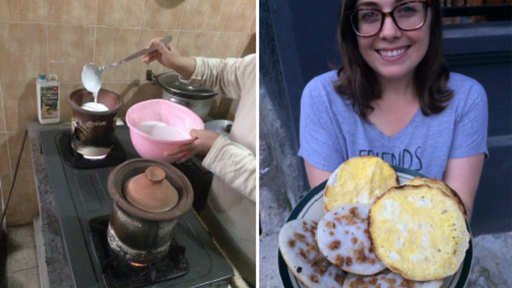 Cooking was never something I considered my hobby until joining the Peace Corps and I couldn’t be happier with the skills and recipes I have learned while being here. I make western food once a week for my host family. Every Monday since we arrived at site, I have whipped up something special for the host family to try. They love inviting the neighbors over to try the new foods. My favorite dishes I have made are tacos, hamburgers and lasagna. When I made tacos, I used black beans that I had brought from America. My host brother loved them so much that I gave him some dried beans and he planted his own black bean garden! We wanted to introduce Italian food to our host family so I made lasagna. This was a difficult task because it calls for a lot of cheese that we do not have. I had my counterpart bring me fresh cow milk from her village so that I could make homemade cheese. My host family was very skeptical about what I was doing with this milk, but absolutely loved the final product. They often ask for me to make lasagna so I always have to set aside a couple of days to collect the ingredients and make the homemade cheese. 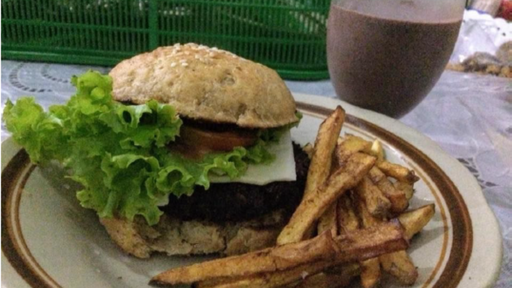 When Indonesians think of American food they instantly think of hamburgers. Because of this, I wanted to show my host family what a real “American” hamburger was like. Even though I don’t eat beef, I was donated about five kilos of beef during the Idul Adha holiday. I used this beef to create several hamburgers for the neighborhood. They also enjoyed freshly baked hamburger buns since bread is hard to find. 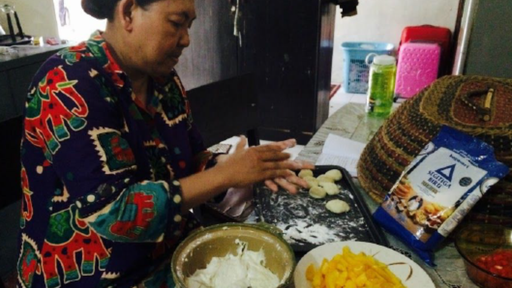 Fast forward to month 22 of 27 of my Peace Corps service, while visiting my hometown for medical leave and holiday in America, I had the beautiful experience of sharing my favorite foods with my family and friends. I was so excited to find an Asian market in my hometown. Little did I know that I have always lived so close to this market that carried all the traditional staples needed to create the new foods I’d learned to make in Indonesia. Indomie (instant noodle brand), rendang (spicy meat dish), kecap manis (sweet soy sauce), and even durian were found all within a mile of my home. 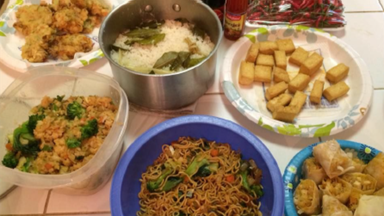 My entire family gathered together to enjoy multiple Indonesian dishes that I whipped up. I feared they would turn their nose up or not enjoy the spiciness but to my surprise every bite of food was devoured. For my family, I cooked rendang, sate ayam, nasi goreng (fried rice), mie goreng (friend noodles), tahu goreng (friend tofu), kolak pisang, lumpia, bakwan and nasi liwet. I also made rambutan tea and kopi luwak to drink. Little did I know that joining the Peace Corps would allow me to discover my true love language: FOOD. Rebekah Satcher, a Mississippi native, holds her bachelors degree in Elementary Education from the University of Southern Mississippi and her Masters degree in Mild to Moderate Disabilities, Special Education from William Carey College. Prior to joining the Peace Corps, Rebekah taught elementary and special education for five years. She has been serving in an Islamic middle school in West Java. Her ultimate goals as a Peace Corps Volunteer are to create meaningful and lifelong friendships, learn about Islamic culture, and share her passion for education with Indonesia.